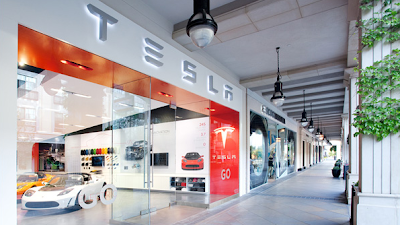 The very first Tesla store--which just so happens to be located at Santana Row--has outgrown its space. Unofficially I have heard that this is the most successful store in the Tesla network. The fact that I now see up to nine Model S sedans each morning on my commute is evidence that they are doing pretty damn well (I can't help but to count them). At the Row, Tesla is just moving a few spaces down into to the store formerly occupied by Burberry. In addition, they will continue to keep the area in the parking structure where they store test drive vehicles and let Tesla owners charge their cars for free. Tesla is also hosting a party on April 3rd between 6:30pm and 9pm to celebrate the new store!